4L Trophy comes to a successful finish! The 4L Trophy Rally has come to its end. 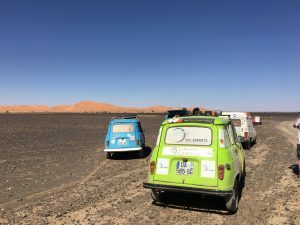 Lingua Custodia was proud to have sponsored Lucie & JB for this amazing adventure filled with the high adrenalin of the race and a pit stop to distribute school supplies to children in isolated villages. Here is a great picture of the 3rd stage of the rally in the “sandbox” with a background of the dunes of Merzouga in Morocco, where they had to travel in this terrain for approximately 102 km. Well done Team! !